An almost full programme of EFL action went ahead on Saturday after the FA Cup second round last weekend saw many clubs in League One and League Two otherwise engaged. 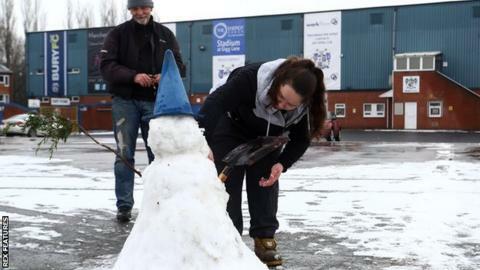 A wintry blast of snow flurries in the north-west gave groundstaff some anxious moments, but games at Bury and Accrington were the only postponements. Meanwhile, down south, Charlton Athletic were celebrating a special anniversary - but Portsmouth proved to be party poopers. Here are some of the stories that may have escaped your attention. Nigel Adkins found himself back in the world of football management on Thursday as Championship strugglers Hull appointed him as their head coach. The Tigers parted company with Leonid Slutsky last weekend after slumping towards the relegation zone with just four wins in 20 games. Former Southampton and Reading manager Adkins had been out of work since leaving Sheffield United in May 2016 and began life in the Hull dugout at home to Brentford on Saturday. After David Meyler deflected an Ollie Watkins shot into his own net, it looked like being a difficult first afternoon for Adkins, but his new side came roaring back in the second half. Kamil Grosicki, Seb Larsson and Jackson Irvine all found the back of the net to turn the game around and despite Brentford pulling a second goal back with three minutes remaining, Hull and Adkins clung on through nine minutes of injury time. The three points also saw them climb to 18th and six point clear of the drop zone. "I absolutely loved it having not been in the dugout for 18 months," Adkins told BBC Radio Humberside. "The players were top drawer today and obviously the results haven't been going how we would've liked. But, they showed some great character and team spirit against a very good side. Life off the pitch has been tricky for Charlton fans in recent years with Belgian owner Roland Duchatelet continuing to face opposition from fans of the League One club. But the Addicks faced an even tougher battle in the past when they were left exiled from their home ground for seven years between 1985 and 1992. Twenty-five years after the club's supporters helped return Charlton to The Valley, the fixture computer coincidentally conjured up a meeting against the very same opposition in Portsmouth. Charlton somewhat befittingly won 1-0 back on 5 December, 1992 and on 9 December, 2017, the home side wore replica shirts from that game to mark the anniversary. But the hosts could not replicate the scoreline as a Josh Magennis own goal in the second half gave Pompey all three points in front of 3,870 travelling supporters. Before the game, seven of the side who stepped out in the red and white shirt in December 1992 led the two teams out, including Colin Walsh, who scored the winning goal that day. If you'd nipped out early for your half-time cup of tea between Bradford and Rochdale, chances are you would have missed a fair chunk of the seven goals the two sides served up. The Bantams eventually won an incident-filled League One encounter 4-3, but four of the goals came within seven minutes towards the break. Another goal for either side followed in the second half and after the game, Dale boss Keith Hill was less than impressed with his side's attitude and display. "That's probably the most disappointed I've ever been as manager at Rochdale," he told BBC Radio Manchester. "We plan all week and do our due diligence and it gets thrown out the window by player decisions. "The players are absolving themselves of any responsibility and it's hard for me as a manager. "I may as well stay at home all week and turn up on a Saturday, put the names into a hat and say, 'go out and play DIY football'." Different week, different name has been the way of things for Plymouth goalkeepers for much of this season. On Saturday against Gillingham, Kelle Roos became the seventh player to stand between the sticks for Argyle as they looked to secure a vital three points against fellow League One strugglers. Roos, on emergency loan from Derby County, followed in the footsteps of Argyle's contracted shot stoppers Luke McCormick, Kyle Letheren and Robbert te Loeke, all of who are currently sidelined with injuries. Norwich's Remi Matthews and Hull's Will Mannion have also had spells on loan at Home Park this term, while youth team goalkeeper Michael Cooper has also featured as a substitute. Roos found himself at the centre of a big talking point on his debut when Gillingham striker Tom Eaves thought he had given his side the lead. But Eaves' goal-bound shot, which appeared to cross the line, was clawed back by Roos and referee Darren Handley and his assistants waved play on amid continued protests by the Gillingham players and their manager Steve Lovell at half-time. After Joel Grant and Eaves traded second-half goals, it was left to Toumani Diagouraga to score a dramatic 90th-minute winner that lifted Argyle off the foot of the table. Winter rolled in with a chill on Saturday as snow flurries descended across the north of the country. Two fixtures fell victim to the weather as first Bury v AFC Wimbledon in League One failed a pitch inspection and then eventually, Accrington Stanley's game with Swindon was also postponed. But, confusion surrounded the Wham Stadium in the hours before the game as first the club were confident the game would go ahead after the pitch passed its initial inspection at 10:30 GMT. Still, I imagine an unexpected free afternoon in Lancashire with two weeks until Christmas gave Danny ample time to buy a few more gifts for friends and family!